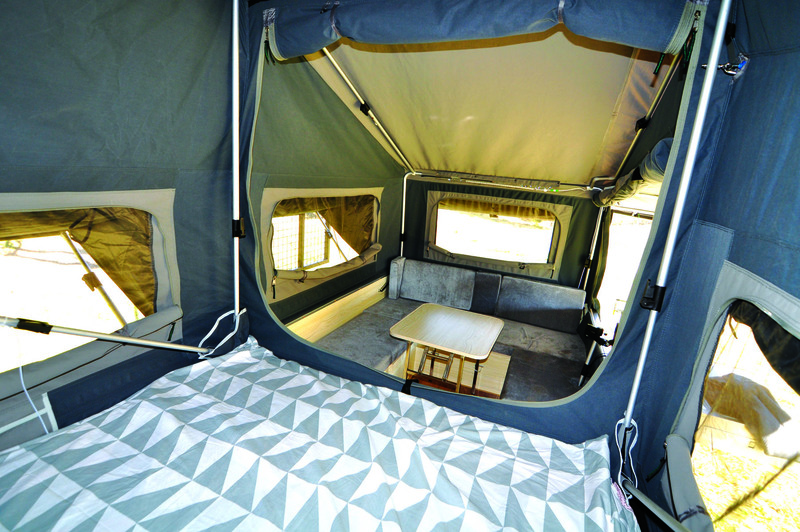 Queensland’s Austrack Campers are experiencing terrific growth in the RV market, and justifiably so, given their premium range of vehicles and accessories, duly presented with professionalism and individual flare. 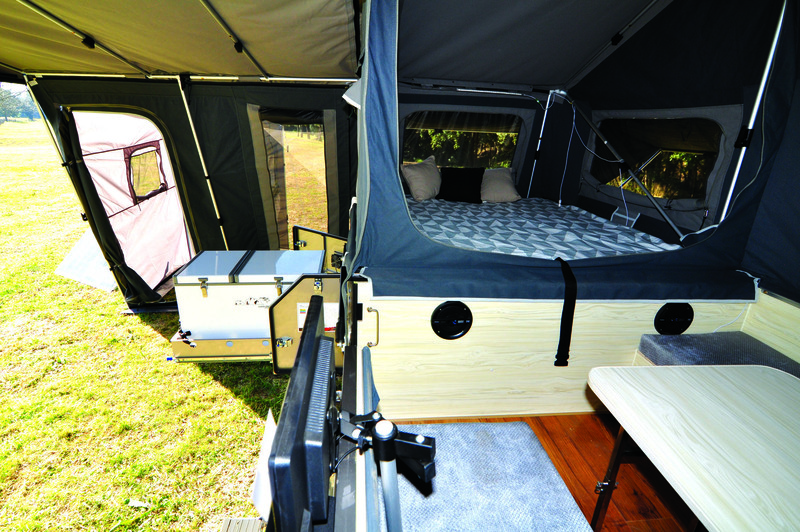 In a crowded market full of forward fold campers, a few stand out – including Austrack’s Telegraph and Savannah models. The Savannah has the extenda out in back, but personally I prefer the Telegraph with its lesser weight, easier assembly and lower cost, as I don’t have a large family to contend with. Austrack introduced the X-series to offer customers a premium version of existing models that incorporated all the bells and whistles. However, on talking with Austrack’s Linden Lawson it seems the models in the X-series are now pretty much the standard units; very few buy the limited packages. To an extent, this makes sense – the Telegraph X is a terrific package with premium manufacture and presentation, with a host of sensible fittings and accessories. 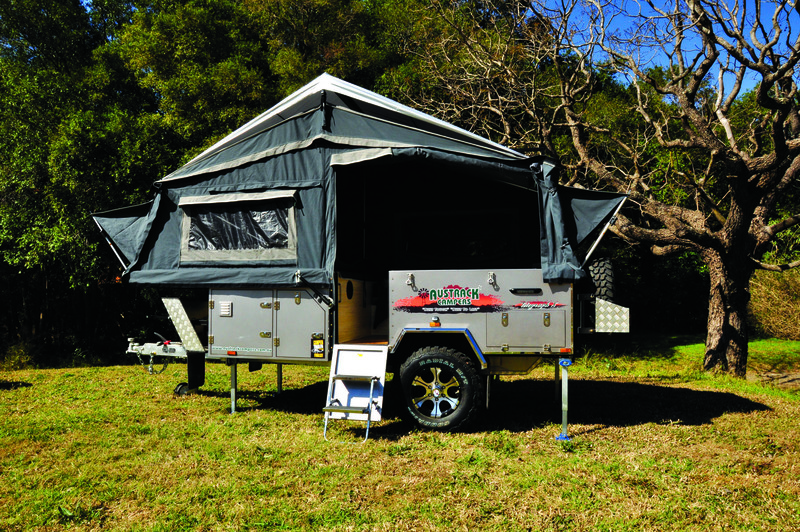 Last year, the judges at Camper Trailer of the Year agreed, saying it “has just about everything you need for a comfortable stay at camp.” All for a very competitive price. Austrack aren’t just resting on their success either. They are keeping track with ever-changing needs, wants and technology, continually striving to further improve upon a very solid base. Hence there’s a long list of innovations for the all-new 2018 model. The foundations have remained the same as the Telegraph X we previously fell in love with. 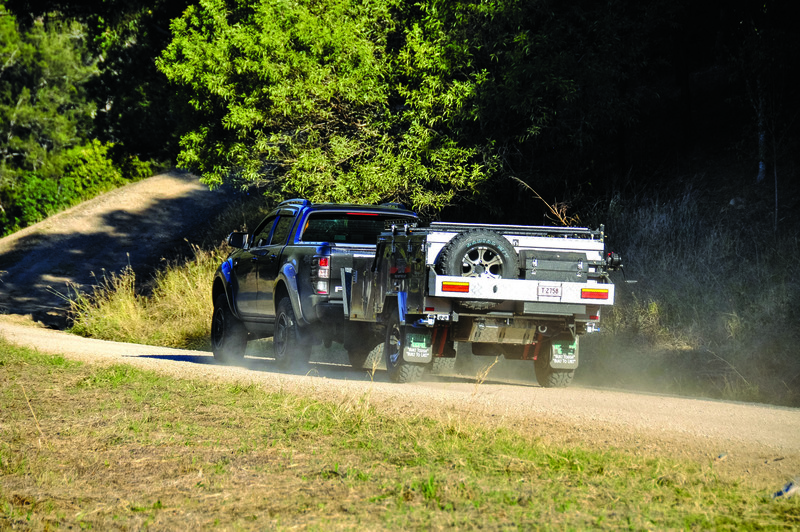 It rides on a 100 x 50 x 3mm chassis with dual recovery points at the rear and a 120 x 50 x 4mm drawbar that runs back as far as the suspension – all hot-dip galvanised. 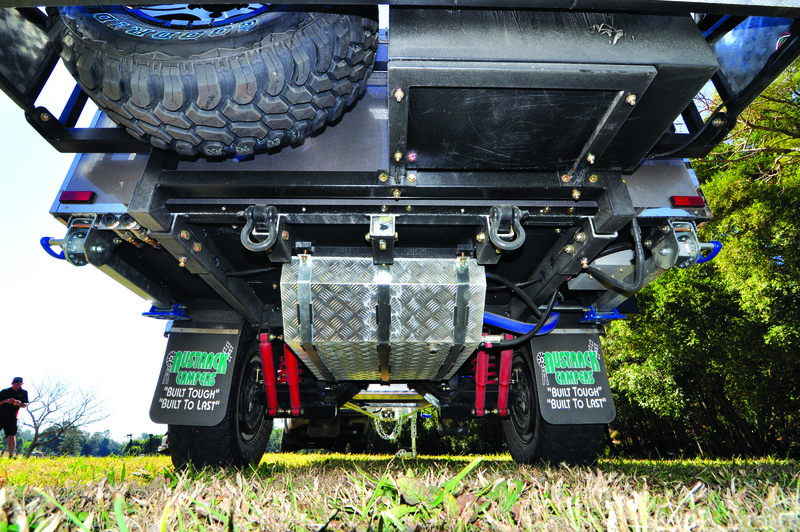 This supports a trailing arm independent suspension with dual shocks and 12” electric brakes behind the six-stud hubs. The wheels are 16 x 8” alloys with the early LandCruiser six-stud pattern mounting 265/75 R16 mud-terrain rubber, though all-terrains are optional. The spare travels on a rear rack, adjacent to a neat little storage box, with carpet lining and a gas strut assisted top. The latter can be bypassed in favour of a second spare if desired. At the front is a 3500kg-rated McHitch Uniglide Platinum coupling, dual rated safety chains and the excellent swing-away Ark XO dual wheel jockey wheel. The body is manufactured from Zincanneal steel and is a little deeper than some, creating larger internal volume. Externally, the body has baked enamel metallic paint with polished stainless steel trim for a smart appearance. Underneath there’s a good coating of underbody deadening for the floor, chassis and drawbar. Out in front are mud flaps and a checkerplate aluminium stoneguard with two 20L jerry can holders and rings for dual 9kg gas cylinders. 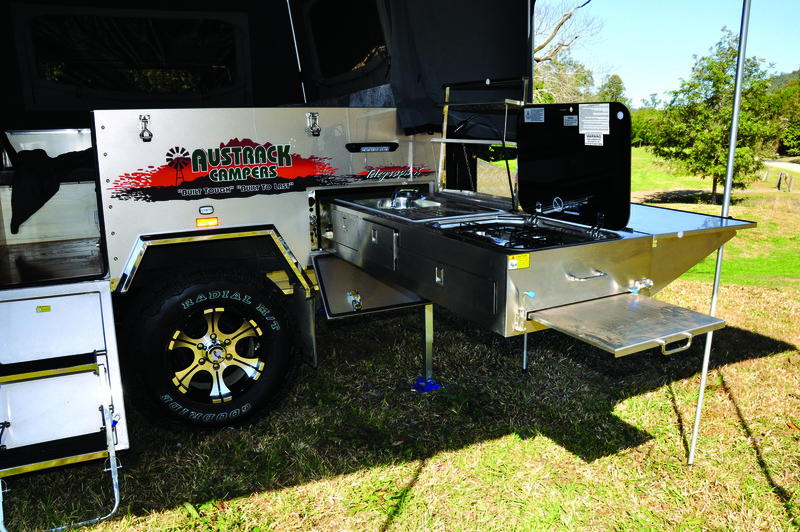 Gas lines are plumbed to a bayonet connection at the kitchen, plus there are connections at the front of the camper for the hot water system and at the rear for a separate barbecue outlet. 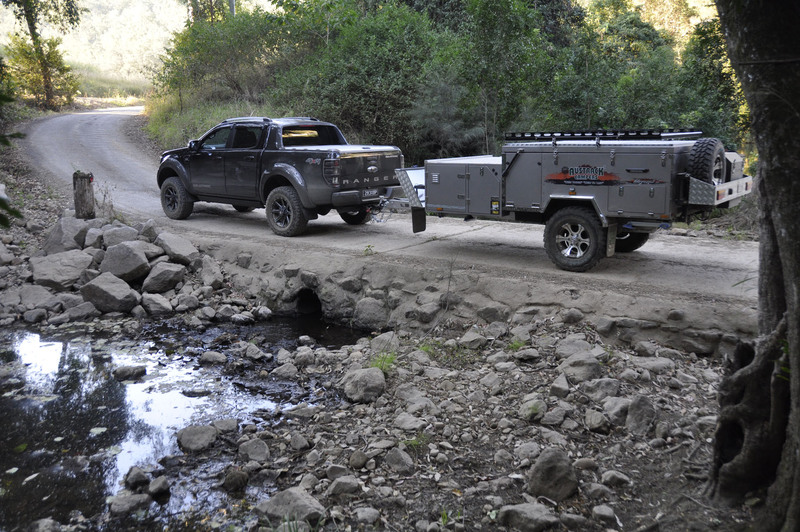 The tent folds over easily with gas strut assistance, but winches at the front and rear can help if you need a little mechanical assistance. The canvas is all a heavy 16oz two-tone fine weave and the tropical roof erects automatically. Additionally, gas struts on some tent bows assist in setup. There’s also an annexe with full enclosures and floor. Inside is a privacy screen with midge screen enclosing the queen size bed, plus internal window covers. All windows have inner and outer awnings with midge-proof screens. The tent side above the kitchen can be rolled up café-style. We all loved the colour-coded diagram on the inside of the pantry door, showing the details and numbered poles. They say imitation is the greatest form of flattery and many others have now copied this great idea. The Telegraph X is equipped with a host of sensible and powerful electronics. It has a 1500W sine wave inverter, 20A multi-stage mains charger, 160W solar panel, digital voltmeter, amp meter, battery management system, adequate 12V and USB plugs, and a 240V external input and output. There’s 170L of water in two shrouded stainless steel tanks plumbed to the kitchen and the camper front to service the shower ensuite. In the front box is an EvaKool 75L dual zone fridge/freezer in a fan-vented locker next to two roomy pantry drawers, with options available as required. On the driver’s side is a large carpeted dustproof compartment, with a divider; one shelf is suitable for poles or fishing rods, whereas the other side has a drawer. The stainless steel kitchen is a ripper! It has a slide-out bench area that sits on a bracing leg, a three burner Smev stove, a roomy sink, a stainless dish rack and two drawers: one suitable for cutlery, the other for cooking utensils. The queen size bed has a light strip and two small pockets for glasses, books, phones and keys. All zips have linen tags for easy use and there is a second LED light strip with a 5m lead for the main tent area. There’s an inviting convertible U-shaped dinette, with a portable table and thick cushions, that transforms to a further double bed. You can stay entertained with a 19in TV with DVD and USB input that has both internal and external mounts – or you can just enjoy the serenity! 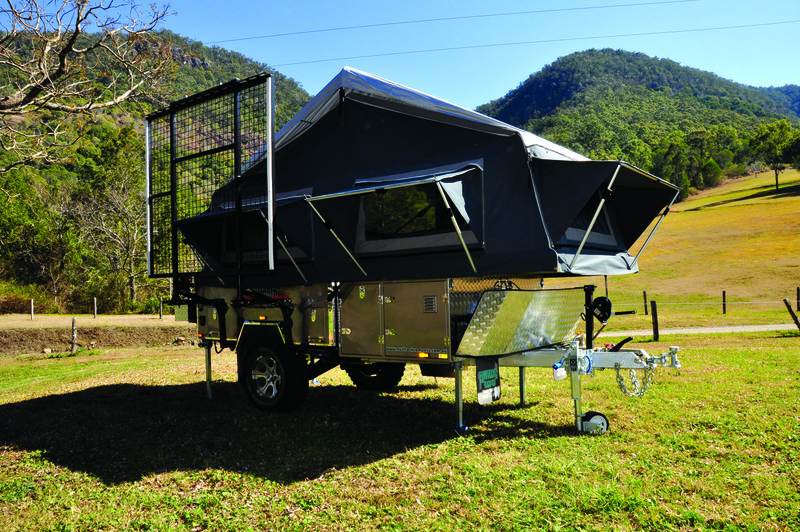 The Telegraph X has a host of other features including a gas strut assisted boat rack, a portaloo, wheel chocks, a bike rack at the rear, water level gauges, and a Country Comfort instant gas hot water service that sits on a pole adjacent to the supplied ensuite and shower. The list goes on with front and rear drop down stabiliser legs, a fire extinguisher, T Spirit Level on the drawbar, a tilt down spare wheel bracket for easy removal, and a foldaway internal grab handle at the stairs. Add to this that all of the doors and hatches feature double pinchweld seals and that the camper comes with a gas certification certificate for peace of mind. With the help of a few wonderful additions, the 2018 Telegraph X wraps up as a very complete home away from home. 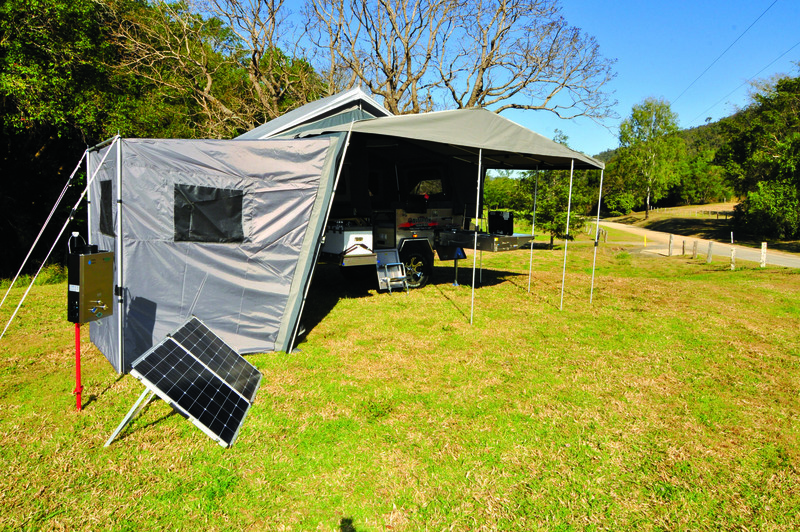 Additions include: the ensuite privacy room; portaloo; shower hoses and rose; wheel chocks; an additional transferable LED light; the EvaKool 75L dual zone fridge/freezer; entertainment, including a remote controlled TV monitor, DVD, and stereo with USB and HDMI inputs; a gas strut assisted boat rack with a storage basket (rated up to 150kg); a 160W folding solar panel; portable gas hot water supply with a stand; a bonus stainless steel kitchen shelving unit; and a sand peg kit. The Tare is 1390kg, if you don’t include the bonus inclusions; with them, the Tare rises to around 1440kg. This Tare, along with a ball weight of 140kg (empty) and a load capacity of 610kg, means the Telegraph X isn’t a real lightweight – but it does have an enormous number of inclusions and heavy canvas, which most customers demand. 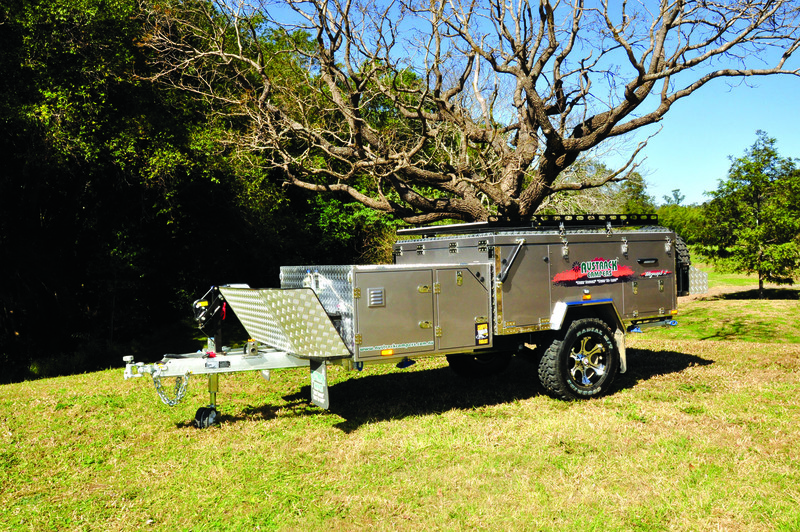 This camper is a well-constructed and very practical unit made by people who are downright good to deal with. The Telegraph X will be your best friend on that next great adventure, other than your family.